They make the most heavenly yogurt and, from time to time, buttermilk. I visited their farm this summer and was entranced when I saw calves gamboling in the fields with their mothers, their dark chocolate coats shining with health and a bit of the devil in them as was evident when a small band made a break and did the Limbo under the fence to go a-munching on raspberry bushes in the parking lot. Naughty, but what happy animals do!! No tethering to plastic coffins for the little guys on this farm. As for their product… it’s amazing. My St. Bernard ate the yogurt from infancy and lived 15 years (without a bang by a car and a spine problem he would have made it to 20). His vet said his insides belonged to an 8 year old. I really felt the yogurt helped considerably and he almost never had “tummy troubles”(and you don't know from trouble when a giant dog has G.I. issues!). So, what do you do when you have some of Hawthorne Valley’s sublime buttermilk left (after making that addictive Old Bay buttermilk marinade from Culinary Travels of a Kitchen Goddess) pasture-raised hen eggs and Milk Thistle (also Biodynamic) cream and you’re inspired by Becky’s heavenly lemony cookies... you make Buttermilk Punch! It’s an old idea that I just mixed up a little. John T Edge said, “ From the 16th century, when the Spanish introduced cattle to the Americas, until the middle of the 20th century, when electrical refrigeration became truly affordable for the working class, the milky residue known as buttermilk was what Southerners drank when they reached for dairy.” In this punch it’s wicked good and rich and full of rum, (part of a formidable class of old-world preservatives) you could call it a Butter&Eggnog! When you are ready, take a hand mixer, whip it into a froth and pour into a punch bowl or pitcher and serve. The photo of the landscape is beautiful as I'm sure the buttermilk is too! Nice site. 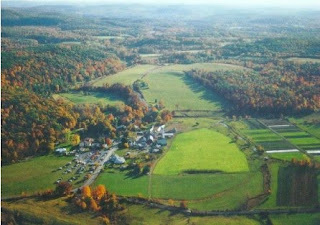 Thanks so much, Crystal... the landscape is more lovely than photo can tell... the buttermilk... thick and delicious. I have made buttermilk ice cream (custard based), so I bet it was somewhat similar. What a tasty looking drink! Erin, I think it would be good to have with your gram's milk drink! oh that punch sounds great! Thanks, It really is... I was thinking you could make it less...caloric... if you used only buttermilk... but, it's the holidays...go for it! This sounds really magnificent. It almost reminds me of egggnog I made recently (similar custard base), only with lemon flavoring instead of nutmeg. I'd love to try this! And that glass punch cup is stunning! Becky, lots of rum makes things even better! I did give people a choice but I go for the cup of rum! Faith, I have to tell you, this is great stuff (tell me about your eggnog?) and the buttermilk adds a great note with the lemon. You can make the base and do both! 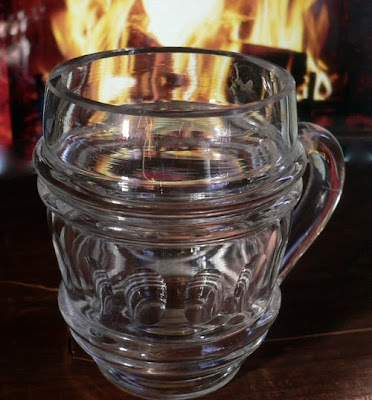 The glass punch cups were a recent eBay find... I am in love with them!!! Glad you feel the same way. What a great post! I love baking wth buttermilk but, have never been a fan of drinking it. Your blog post with rum, cream, honey and farm fresh eggs really bring it to a new level. I think this would be close to a buttermilk egg nog :-) The farm photo absolutely fabulous! Food is so much better the closer to home that it is raised and eaten. velva, don't worry.. you don't taste buttermilk... it all blends together... there's a slight tang to the taste. wow! 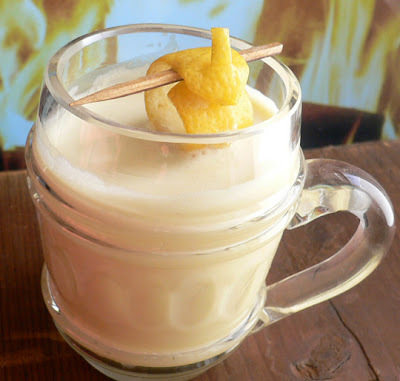 i have been absolutely CRAVING (daily, which is not so good) warm, creamy, christmasy alcoholic drinks. one is usually enough, but i think this is the kind of drink i would have a few too many (and end up w/ a stomach ache!). fabulous - love that it's w/ buttermilk (and local to us!). happy holidays! Happy cows give the best milk! And what a happy scene you pictured. Such an intriguing holiday drink! And I can try it because I have some buttermilk (unfortunately not as fresh as yours) left over from some baking. Of course, it certainly would taste better in a magnificent cup like yours! jplp: take the plunge and drink it... the lemon is good for you... so is rum... just no driving! wanf:Give it a try with lots of friends so you can't drink it all... I only had one other person to help me... and i made the strong version! Barbara: Any product that comes from a happy animal or happy soil tastes better, absolutely!! and yes, everything tastes better in those little cups.. love them and they were a bon marché!! The drink is a breeze to make...those little lemon knots... they were a pain! This sounds and looks just wonderful! Pam, your continuing encouragement is really special to me. As one of my first blog visitors, that you keep coming back is fantastic! Thanks! Cookbookapprentice, thanks, I loved your words about not following recipes religiously... I really believe it! Thanks so much for recommending the Nach Waxman video. I just finished watching it and thoroughly enjoyed his insight. Right on target with what I'm looking to learn more about. It's times like this I miss living in NY and wish I could make a trip to his shop today. Tried it, LOVE it! Thank you so much!! cookbookapprentice.... glad you liked the video...it's really great and so insightful... we aren't all robots with the same tastes...sometimes the oddest things inspire brilliantly... he's a smart cookie!